A picture may be worth a thousand words, but when physician recruiter Regina Levison saw the photograph a job candidate submitted to her office recently, two words jumped to mind: No way! The job-seeking physician sent a photograph of himself on an island. At a bar. Nursing a cocktail. That case of poor judgment shows that physicians “smart, well-educated and attentive to detail by their nature “sometimes miss the mark when staging themselves in the job market. To help you better present yourself on paper, Today’s Hospitalist spoke to four recruiters who regularly screen candidates for hospitalist positions. They shared tips on what they like “and do not like “to see cross their desks. Send a CV, not a resume. For starters, the document to prepare for a hospitalist position is a curriculum vitae “CV “as opposed to a resume. While a resume is appropriate for a management or industry job, such as a medical director at a health plan, a CV is used for clinical positions.Both documents summarize your professional life but use different approaches. A resume is organized to highlight skills and experience. A CV, on the other hand, chronologically lists employment history, education, professional service and honors.In terms of length, disregard the traditional advice for resumes, which holds that they shouldn’t be longer than one page. “Don’t let someone rule you out because you haven’t put in enough information,” Ms. Levison says.When it comes to whether you should include an objective on your CV, recruiters are of different minds, depending on whether they work for a single hospital system or are recruiting for positions through several employers. Ms. Levison, on the other hand, who recruits for many different hospitals, prefers to see the objective in a cover letter or accompanying e-mail. 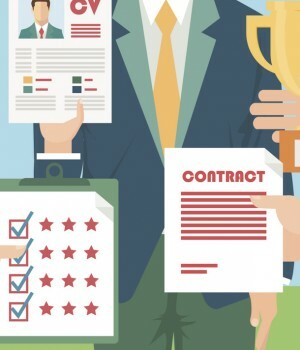 Better yet, she urges hospitalists to craft different versions of their CV, one for individual institutions that includes an objective, and one for independent recruiters that doesn’t. Be upfront about your needs. If you have non-negotiable job criteria, mention those in your cover letter or e-mail so the recruiter does not waste time reviewing your CV.”Some people want to work seven days on and seven days off, and that’s not the way our hospitalists work,” says Mr. Keister from Susquehanna Health. “So if that’s not a negotiable issue, I want to know upfront.”Going through an interview process with the hope that the hospital will meet your demands when a job offer is made is risky business; the hospital may have policies or standard practices that forbid what it is you have in mind.Along the same line, if you submit your CV to a search firm, be clear about the types of jobs that you will accept. Provide key personal information. Recruiters say that it’s a good idea to identify personal information that helps a recruiter recognize a fit “or a poor match “with the hospital and community.At Susquehanna Health, for example, Mr. Keister wants to know about marital status. “It shows if we need to consider job opportunities in our area for a spouse or significant other,” he says.Mr. Keister also likes to see applicants list their hobbies. “If their interests are theater and the symphony, we have some of that here, but there’s more in the big cities,” he says. “If they like the outdoors and sports and boating, we have plenty of that to offer and I know what to talk to them about.”Dr. Messick in Winston-Salem likewise looks for information about professional interests, future goals and even personal connections to the area. Send pictures to your mother, not the recruiter. And while more CVs these days tend to include photos, Ms. Levison says that recruiters do not want to know what you look like. Lola Butcher is a health care business writer who is based in Springfield, Mo.